Come and stays in the prime location where everywhere is easy to reach, whether you're here for leisure or business. The team and I look forward to welcoming you in our beautiful and modern hotel, let's create unforgettable memories together. 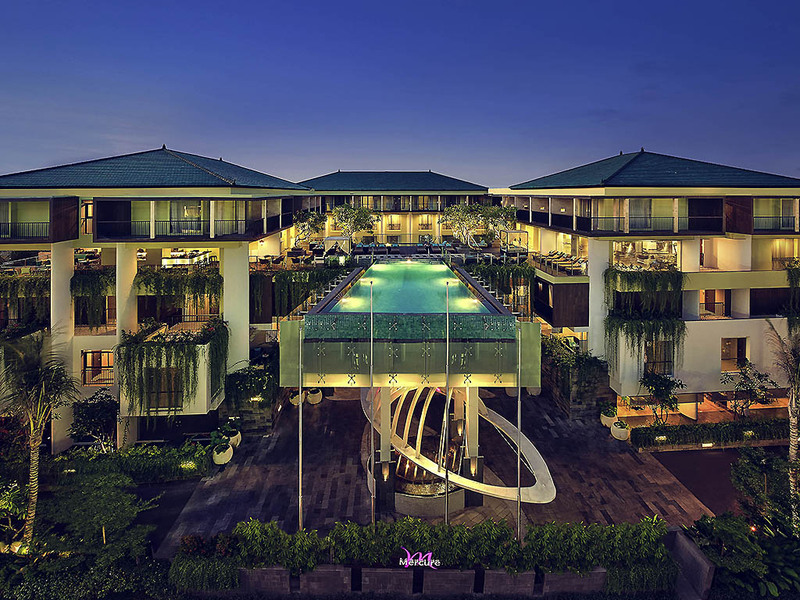 Strategically located on the main street of Legian and a mere stroll to the famous Kuta and Legian beaches, exciting nightlife, numerous restaurants and the famed shopping district of Seminyak, Mercure Bali Legian is the perfect choice for the explorer. . It was a great hospitality.staff are so respective.all things are great there. I wish when I come Bali I stay here. Amazing holiday in Bali.Wish I had of stayed longer. Beautiful people ,Friendly staff, Great central location Resort.Clean & good size rooms and serviced well daily.Will be booking & staying again.So many things to do and see. Wonderful staff who could not do enough for us. Overall we were very happy with our stay there. Its our second stay after a brief review which was taken seriously delightful. Upon check in, Dewi, swiftly checked us in and noted us on the special arrangement for our breakfast. The next day, we were astonised by the cutlery arranged and Putra assured us on the request made for breakfast. Shortly later, Melissa who responded to my review guide us through the pointers made, from the diet and room preparations. Appreciate the whole team for making the stay wonderful. For sure, we be back again and share the praise to our family and friends to consider Mercure Legian. The staff were very happy to look after the customers. I love the location and felt safe staying there. It was always clean and the meals were excellent. Looking forward to going back to staying there. Great value for money. Our stay was wonderful, only thing I can think of to change/improve is to put a bench or seating outside the reception where the smoking area is. I absolutely loved this hotel. It was very convenient for what we had planned to do. Close to bars, restaurant’s, shopping, beach. Great staff, service and ALL the staff are so polite and welcoming. There only down fall was that the room could have been cleaner and maybe an air-freshener in the room, as gets smelly from always having the aircon on. Our experience was great from check in to check out, good breakfast selection and very helpful staff always smiling and ready to help. Pool staff were extremely friendly. My only negative comment is that I was required to pay the room charge in full upon check in. Not necessarily a negative thing but rather surprising as I have never been asked before to pay my bill bill at check in. Otherwise I only have positive things to say about the hotel and staff. We had such a ood experience at Mercure Legion, staff went above and beyond to make sure we had everything we needed. Definitely reccomand this hotel if must stay near Kuta Beach. Breakfastbjad a great selection with fresh Juice bar. I stayed 10 days at the Mercure , I stayed in the plunge pool room and had an amazing time. Staff were friendly, food was great. Value for money. Only issue I did have was tv kept not working every day but other then that I can’t fault this resort. Central to everything, security out front always welcoming and friendly. All staff members were more then accommodating and friendly to ensure it was a great stay. I would come back to Bali purely for the accomodation. This is one of our most favourite places to stay in Bali. This is the third time we have stayed here and highly recommend it. The staff are fantastic. The position is terrific and you can walk nearly everywhere you need to from there.